I’m grateful for Jeff Goins and others like him who have nurtured their dreams, trusted their guts, and pursued their passions despite the fears, frustrations, and obstacles they inevitably encountered. They pave the way for the rest of us to do the same. I’m so thankful that Jeff and his team had a vision for Tribe Conference that they fought to make a reality. I’m thankful that I was lucky enough to find out about it four years ago, and have had the means to attend every year that it has existed. Tribe Conference is like a watering hole in the desert, it’s a shining beacon of light and love in this world, and a wonderful place for creatives to come together and be fully accepted and accepting of one another. I’m thankful for that moment at Tribe Conference on Saturday afternoon when Alli Worthington said these words: “Normal people don’t come to things like this. They don’t pay to sit in a conference all weekend. Normal people are at home watching college football.” This statement didn’t offend me. In fact, it resonated so deeply with me that I’m still thinking about it a week later. She is absolutely right. This work, this calling to write, this yearning to make a difference in the world - it’s not for the faint of heart, and it is certainly not “normal”. 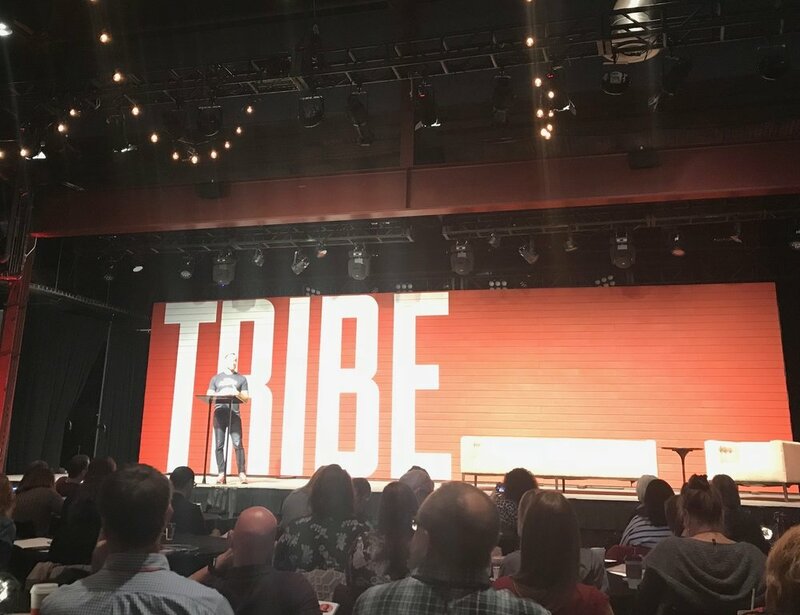 I’ve spent a lifetime not quite fitting in with the college football watchers of the world, and I am beyond grateful to have found a group of people at Tribe Conference who are so very similar to me in so many ways. I’ve found a Tribe of folks who “get” my heart’s desires, and who share them, who feel the same pull toward sharing their storiess in hopes of making a difference in the world. I’m so grateful to have found my Tribe of people who would choose to sit at a writing conference all weekend over just about anything else in this world. I’m grateful that I did not let FEAR talk me out of attending Tribe Conference this year. I’m an introvert and I have some anxiety surrounding social events such as this. But I decided that my dreams of publishing a book and my burning desire to learn more about writing and sharing my message were more important than my fears. So I did it afraid. I walked into Liberty Hall terrified. I walked right up and introduced myself to new friends, heart racing and palms sweaty. I approached the speakers to let them know how much their words resonated with me, with fear threatening to consume me. But I did it. And if I can do it, anyone can. I’m grateful for the friends I have made at Tribe Conference over the years. It is always such a joy to catch up with these folks, and to hear the amazing things that they are up to. To Bri, Sandy, Laura, Jody, Laura, Danielle, Christine, Stefanie, Deb, Ken, Chad, Carolina, and so many more: THANK YOU for making this tribe so very special. I’m grateful for the amazing speakers who share their wisdom so generously at Tribe Conference every year. This year was the best yet - with some of the most amazing and inspiring speakers I’ve ever heard. These folks ain’t playin’. They bring it for real, inspire the crap out of us, and leave us on the edge of our seats, begging for more. The level of motivation and inspiration that I receive from the speakers at Tribe is unmatched by any other event I’ve ever attended. These people are living their best lives, doing amazing things in the world, and they set me on fire to do the same. And 2016 Tribe Conference recap here: Why I Left Tribe Conference In Tears.